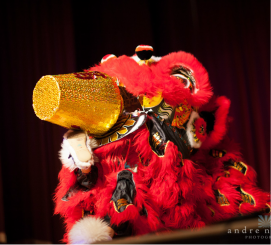 There are generally three factors that are needed to make up the Lion Dance: the head, the tail, and the drum or musical section. The musical section is normally made up of: a drum, a gong, and multiple pairs of cymbals. 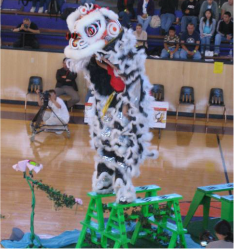 The most recognizable positions in a lion dance troupe are either the Lion's head or the drum. The tail position is often overlooked by most people and is undoubtedly one of the most difficult roles to play. The person whom is the tail must make sure that she/he follows every step that the head makes every time and also follow the music. She/he is also required to be couched over in an uncomfortable position in order to operate the tail. With recent evolutions of the lion dance, the tail becomes more important with the number of stunts and acrobatic tricks that are used today. The drummer also has a difficult job. They must follow the Lion with their beat and also lead the lion when a change of plans suddenly happens. The drummer must also adjust if the Lion happens to make a mistake. They must be versatile. Less common nowadays, but still utilized is the Buddha head. The Buddha is a Chinese monk. The person must wear a mask which is usually painted pink (white for a female) over their head. They must wear a robe and also carry a fan which is made up of a palm leaf. Traditionally, they play with and tease the Lion. She/He must lead the Lion to the lettuce, called the Lion's Cheng, which the Lion tries to catch and eat. This denotes good luck. The Buddha is also a very demanding role to play. The person playing it must be a very athletic and perform movements like an acrobat by doing cartwheels, jumps, and various Kung Fu moves. But in return, the Lion, depending on it's mood, will either play with, chase, bite, and or kick the Buddha around. By far, the most important role is the person who plays the Lion's head. They must be very versatile and very athletic. In order to play this position, the person must have the ability to make cat like movements with only the use of his lower body. His upper body duplicates the head movements, which leaves the hands and arms to control the eyes, mouth, ears, and facial expressions. 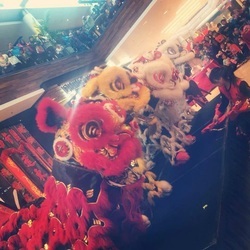 There are two basic methods used when performing the Lion Dance. The first is called the freestyle method, in which the dancers must improvise by making up all the moves as the performance moves along. The dancers must also have the skills to be able to follow the music being played with the Lion's movements at the same time. This method is primarily used when performing in the streets. For example, during the Lunar New Year, the Lion dancers traditionally take their lions and dance their way though the streets and alleyways, going to every door of every building that are on blocks that are within the area. The Lion pays a visit and dances in front of the entry way to bring good luck. Those who are visited will put out a Cheng, which could be a piece of lettuce or oranges, along with a red envelope and sometimes a traditional puzzle will be set out. A true test of knowledge and experience is needed when the Lion is confronted with a puzzle. The Lion must know how to solve it. For instance, if there is a pan of water with some coins at the bottom, the Lion must remove a certain number of the coins and leave a certain number of coins in order to fulfill the traditional act in order to bring good luck. There is a long list of traditional problems the Lion must know how to answer correctly if he is to show the quality of the Lion Dance school. The second method of Lion Dancing is called a routine set, in which the dancers know exactly what moves are going to be performed before hand. Everything from stunts, footwork, music, and movements are choreographed so that the entire routine is synchronized.